Remove the brake calipers, left and right. do not operate the brake lever with the caliper removed. Loosen two axle pinch bolts (1) on the right front fork leg. Remove the front axle bolt (2). Raise the front wheel off the ground and support the motorcycle with a jack or a wooden block. do not carry out the work with the motorcycle resting on the side-stand. Do not support the motorcycle with the exhaust pipes. Make sure that the motorcycle is supported securely. Loosen two axle pinch bolts (3) on the left front fork leg. Draw out the front axle (4) and remove the front wheel. Remove the collar (5) (rh only). 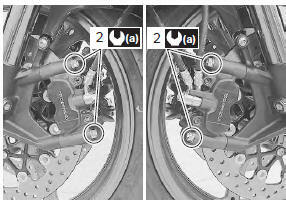 after removing the front wheel, fit the calipers temporarily to the original positions. Install the collar (1) to the right side of the wheel. arrow on the tire should point to the wheel rotation. Insert the front axle from the left side and tighten the front axle bolt temporarily. 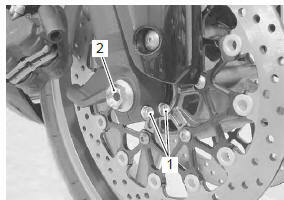 Tighten the brake caliper mounting bolts (2) to the specified torque. the brake calipers, pump the brake lever until the pistons push the pads correctly. 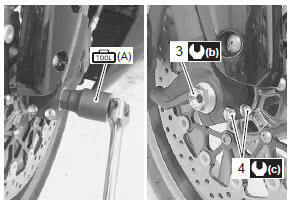 Hold the front axle with the special tool and tighten the front axle bolt (3) to the specified torque. 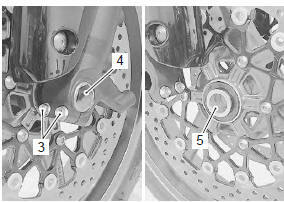 Tighten two axle pinch bolts (4) on the right fork leg to the specified torque. 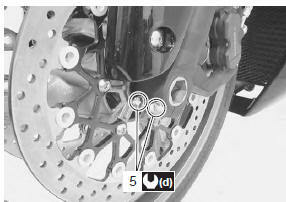 Tighten two axle pinch bolts (5) on the left front fork leg to the specified torque.